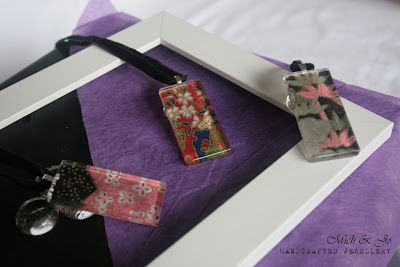 Each pendant is sealed with special japanese paper on a rectangular glass tile. Chain is made with black velvet ribbon with lobster clasp. Note: Pattern layout may differ slightly for each pendant as these patterns are cut out of a huge sheet of washi paper and each one is unique and one of a kind. Caring for your product: All Pendants are water resistant, but not waterproof. Please remove before showering and swimming,etc.